Except for the part on the Bible this post is largely a reworking of the excellent wikipedia article on Epicuros (341– 270 BC). Please, read the entire text there which includes references and links. Instead of trying to rephrase the sentences in wikipedia I copy here some of the text. The idea is to emphasize certain aspects in Epicuros life and thinking that are of particular interest in the theological framework that I have in mind. Apostle Paul met Greek philosophers in Athens and they were rather amused with his talk about eternal life. Also the quote in Paul's letter to the Corinthians possibly refers to Epicurus in the context of resurrection of the dead. If the dead are not raised, let us eat and drink, for tomorrow we die. After the death of Alexander the Great, Perdiccas expelled the Athenian settlers on Samos to Colophon, on the coast of what is now Turkey. After the completion of his military service, Epicurus joined his family there. He studied under Nausiphanes, who followed the teachings of Democritus. In 311/310 BCE Epicurus taught in Mytilene but caused strife and was forced to leave. He then founded a school in Lampsacus before returning to Athens in 306 BCE. There he founded The Garden, a school named for the garden he owned that served as the school's meeting place, about halfway between the locations of two other schools of philosophy, the Stoa and the Academy. 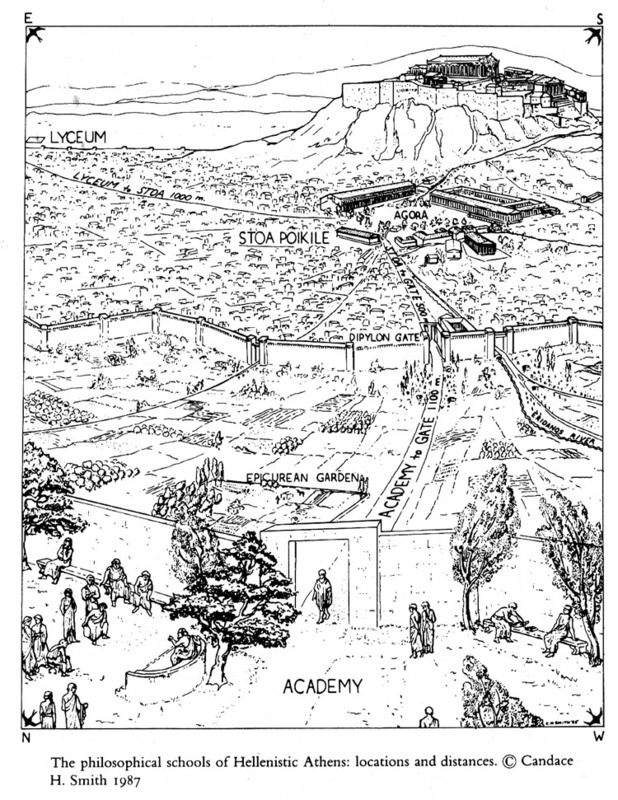 Epicurus' school, which was based in the garden of his house and thus called "The Garden", had a small but devoted following in his lifetime. The primary members were Hermarchus, the financier Idomeneus, Leonteus and his wife Themista, the satirist Colotes, the mathematician Polyaenus of Lampsacus, Leontion, and Metrodorus of Lampsacus, the most famous popularizer of Epicureanism. His school was the first of the ancient Greek philosophical schools to admit women as a rule rather than an exception. The original school was based in Epicurus's home and garden. Epicurus is a key figure in the development of science and the scientific method because of his insistence that nothing should be believed, except that which was tested through direct observation and logical deduction. He regularly admitted women and slaves into his school and was one of the first Greeks to break from the god-fearing and god-worshipping tradition common at the time, even while affirming that religious activities are useful as a way to contemplate the gods and to use them as an example of the pleasant life. Epicurus participated in the activities of traditional Greek religion, but taught that one should avoid holding false opinions about the gods. The gods are immortal and blessed and men who ascribe any additional qualities that are alien to immortality and blessedness are, according to Epicurus, impious. The gods do not punish the bad and reward the good as the common man believes. 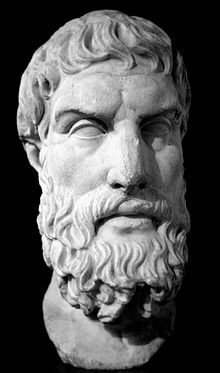 The opinion of the crowd is, Epicurus claims, that the gods "send great evils to the wicked and great blessings to the righteous who model themselves after the gods," whereas Epicurus believes the gods, in reality, do not concern themselves at all with human beings. Epicurus didn’t deny the existence of gods. Instead, he stated that what gods there may be, do not concern themselves with us, and thus would not seek to punish us either in this or any other life. He also believed (contra Aristotle) that death was not to be feared. When a man dies, he does not feel the pain of death because he no longer is and he therefore feels nothing. Therefore, as Epicurus famously said, "death is nothing to us." When we exist death is not, and when death exists we are not. All sensation and consciousness ends with death and therefore in death there is neither pleasure nor pain. The fear of death arises from the belief that in death there is awareness. Epicurus took the teaching of the "laughing philosopher" Democritus in earnest. The views shown above in the quotes from wikipedia can all be understood from the fundamental materialism - everything is just the random movement and colliding of atoms. Nothing really matters. A woman is as much atoms as a man and so is a slave. Under these materialistic parameters of human existence in a random world let us try to make the best of it: minimize harm and maximize happiness. There is pleasure and pain in life, let us try to be happy in the midst of it. It is impossible to live a pleasant life without living wisely and well and justly (agreeing "neither to harm nor be harmed"), and it is impossible to live wisely and well and justly without living a pleasant life.